You are here: Home > Hope after the march! March. Thousands upon thousands filled city streets around the globe to give a voice to the voiceless. The historic event was first masterminded by Surge animal activist group, who were the force behind the eye opening documentary Land of Hope and Glory. Surge organized the first animal rights march in 2016 with 3,000 people taking over the streets of London, a number which nearly doubled in size in 2017. The event extended it’s reach this year with NYC, Miami, Los Angeles, and multiple Romanian locations, as well as many others marching in solidarity with London on September 2nd. I had the opportunity to participate in the NYC march with almost 3,000 other activists! 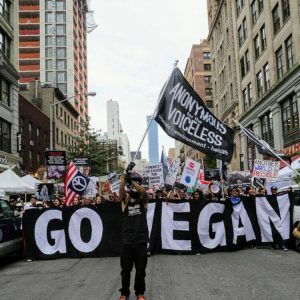 As a vegan animal rights activist, I often feel lonely but participating in the march gave me a renewed sense of hope! To be marching through the streets of New York with other fellow activists who hold the same beliefs that I do is quite empowering! We gathered at the Flatiron building to march our way down Broadway ending up at Tompkin’s Square Park; locations chosen specifically due to their history with social uprising. The march kicked off with inspirational speeches from march organizers and seasoned activists. Dozens of animal rights & rescue organizations were present to raise awareness of the causes they dedicate their lives to as activists carried signs with all sorts of animal rights messages and many were wearing shirts bearing the same types of messages. There were a few drummers keeping beat while we chanted through the streets as bystanders stopped all along the route to watch, and a few even joined in with us! We are growing and veganism IS the future! 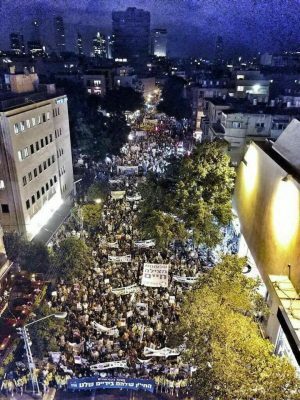 Tel Aviv held it’s Animal Rights March on September 9th with 30,000 animal defenders- the world’s largest animal rights march in history! Ignorance is no longer an option with more and more information becoming available of the cruelty to animals and the adverse affects animal agriculture has on the environment and personal health. There is no excuse for animal abuse and until all are free we will be on the streets fighting for animal liberation!